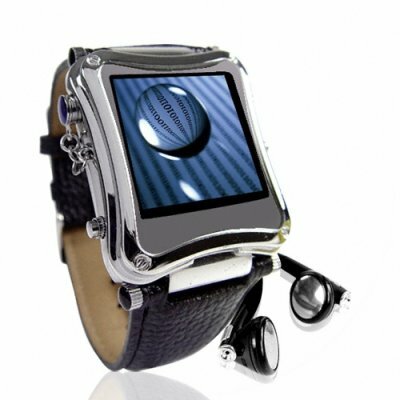 Successfully Added Metallic 1.5 Inch LCD MP4 Watch Player - 8GB to your Shopping Cart. Great looking metallic design MP4 Player Watch, famously called in the press "The Original Metallic MP4 Watch Player with 8GB memory". Wear this digital media player watch anywhere you want, and people will never realize that a cool PMP is actually what they are looking at. The genuine leather strap makes it comfortable to wear, while the vibrant CSTN 1.5 inch display will make sure that watching videos is a wonderful viewing experience. Keep up with the fashion get yourself a high tech dress watch today. Order one today from your favorite electronics wholesaler, Chinavasion! on 2009-01-03 04:08:35 Excellent C R in every respect, good quick postage. I have just received it today but it is a good looking watch with clear instructions as to use, I am sure that I shall have many hours of fun and enjoyment. Well presented and packed. I am delighted! thank you!